Aloha!! I feel like it’s been a while since I posted anything to Youtube. To say my life is busy is an understatement!! Things are starting to calm down and the weather is starting to get cool and drizzly. All the sweater weather that is perfect for staying in and finishing all those to do scrapping things I have been meaning to do. Today I am sharing a mixed media layout that I posted to the Clique Kits Youtube Channel. Here are some close ups of the layout. To see all the products in the Clique Kits store, check out my video and the description box for links. Here is a close up of the cut file and how I raised the inside of the file (the letters) on foam adhesive. I added the cut file right on top of the watercolor splatters I added to my background. I used one of the left over exclusive flair buttons from my Forever Fall mini album class. I layered it with a leaf cut file and some die cuts from the kits. Also tucked into the layers is a cut file that was made exclusively by Zinia to make this kit. Here is one last close up of the cut file and title of my layout. As you can see the mixed media peeks through the leaves on the cut file. I used my silhouette cameo to cut out this file from The Cut Shoppe. Here is a full look at just the layout. This Gather Kit from Clique Kits is perfect for documenting how gorgeous my tree looks this year. To watch my process video look below. Thanks for joining me today!! I hope you have a wonderful day and stay inspired. Don’t forget to join the Clique Kits design team on Instagram tomorrow for the October Pep Rally and Kit Reveal. As you know I have been sharing my work over at my other blog, scrapbookpagesandcupcakes.com. In the next month I will be switching over to this blog again. I am trying to clean up some of my social media accounts and make things a bit easier for me. As blogs really isn’t how I share my work, and blogs aren’t as important as they were, I am thinking the cost of paying for a blog that was never meant to earn money this blog will do all that I need it to do to share with you all the pretty things I make and share on my youtube channel. I will be trying to share more on my blog again when I make a post on my youtube channel or a youtube channel for my design teams. I can’t wait to keep sharing with you all I am creating. Aloha!! I wanted to give everyone a heads up, that this site is no longer where I post all my current blog posts. Today is a super special day because I am posting my first blog post as part of the Clique Kits Design Team. Because I don’t want anyone to miss out on that I hope you hop over to my newer (last year it was new) Blog site, which is, scrapbookpagesandcupcakes.com. Click here and it will take you right to the Clique Kits Design Team Post. Aloha My Scrappy Friends!! I wanted to get on real quick and put out a quick reminder that I have moved my blog from WordPress.com to .com. If you have been wondering why I haven’t had any blog posts since the beginning of this year that would be why. If you had over to scrapbookpagesandcupcakes.com you can follow me over there and check out all the new things I am working on!! Tis been hard lately, I am not gonna lie. The sunny is shining here in Hawaii and I have had no desire to create. I hate when that happens. Life is busy and at the end of the day, I am too tired to use my brain. I am trying so hard not to punish myself for not wanting to scrap. We all have lulls. We all get busy, and we definitely all get tired. Well this week I was up at The Crafty Maven getaway for Art Party Friday. I didn’t even know where to start to tell you the truth. I made a total of two layouts within the last 7 days. So I decided to do a technique I have done before and really like the way it turns out. It is easy. You splatter watered down paint on white cardstock, then use a paintbrush to dab the splatters. You end up with a pretty airy and artsy look. It also is really forgiving. I then used a stamp that had x’s for a little more something going on. I was also hoping the black would tone down the fact that I may have overdid it with all the different color paints I used. I really couldn’t help it though. I was inspired by the rich bright colors in the inspiration from The Crafty Maven Getaway. I love these colors I just didn’t want them so bold on my page, if I could go back I would have not added the orange paint, but in the end I really love how all the colors look on the back ground. I decided to use the Maggie Holmes Bloom collection, for two reasons, the main reason, it’s brand new and I was hoping that would get my all excited. I love breaking into a new collection and cutting up new papers to layer on a background. this excitement really gets me excited about scrapping. I also really liked how the colors of this collection matched the splatters on my background. Sometimes when they seem to work you need to ride that train. I find thats when a layout starts to make itself. To be honest that is really what happened with this layout too. I didn’t have the die cuts from this collection, which I am soo bummed about, but it made me have to dig into my stash and find embellishments that could match this collection and feel like they were meant to be together. I picked out some teal Color Cast Designs acrylic hearts. I picked out a gold glitter chipboard frame from the Maggie Holmes Shine collection. I also took a couple other chipboard pieces of that sheet as well. I grabbed some black and white puffy geo tags from the new Pink Paislee C’est La Vie collection out too. They just worked together, and fit like a glove. When I started working on the layers I knew I wanted them to not be so tight. Lately I have been trying to bring out my inner Jill Sprott and really use layers in a funky trendy way. I cut my layers in different lengths and sizes and almost fanned them out under my photo. I did stick to less colors in my pattern papers since I have so much going on in my background. I really also went for different textures and patterns that were bold, like in the inspiration piece. I love how the chipboard looks tucked under the layers too!! It gives the layout some height which I always like. It helps let you see different angles of the papers and ephemera that maybe you would see if if was all flat. I also think it helps with the playful tone of the story that I journal about. This picture is my oldest daughter using a walkie talkie we gave her for christmas last year. We gave one to each of the girls, but the girls weren’t really interested last year at all. The other weekend the girls were cleaning their closest out and found them. They are really into the My Little ponies right now so to have another thing that had pines on it was really exciting. Then they realized they could talk to each other from different rooms, and boy they couldn’t get enough of these walkie talkies!! All weekend long all they did was try to talk to each other from other rooms, up stairs and downstairs, they even tried talking for outside too. It was fun watching them play with these toys, so simple but complex at the same time! I really wanted to tell this story, and put to paper this photo, this smirk of delight that Leilani has!! I am really glad I ended up keeping it pretty simple as far as embellishments goes. It really made me have to focus more on how to be playful with the layers. Also with a busy background it really didn’t need much more. I tend to not know how to stop, and I am glad I feel like I am really learning this concept, of less is more!! You can watch my process video, over at The Crafty Maven Getaway Channel. Doing this layout, even though it was a technique that was simple and something I have done before really did help me feel like I am catching my mojo. I feel like I want to try another layout to see if that one makes me want to create more. I think that is how mojo works sometimes too. The more you use that muscle of art and creation the more you get that itch to create again. I am ready to pull out another piece of white cardstock and see what journey that piece starts to take me. See where I end up with that piece of paper, what story I end up telling too. I think that is a good place to be when you end a layout, if you ask me. Here is one last look at my layout. Have an inspired Day My Scrappy friends!! It is getting closer to the end of January. How has your month gone so far? Have you been able to stick to the plan you thought up? or have you struggled to stay on top of all those goals you wrote down hoping to obtain? I am slowly and sadly realizing that just because you plan it, it doesn’t matter that you can really keep up with all that you hope to do. Appointments have you tired early in the evening, the kids struggle with you get finish their school work, the dog keeps stealing shoes and the kid’s toys to get your attention, and so many other things that are just apart of life happen. It’s natural. I keep thinking about my One Little Word I choose for my year, Intention. Are the things I am doing this month, now that it is the end of the month, acting on this word? What changes do I need to make for the next month so that I can fully live out this word, Intention. It is hard for me, to be honest. I want so much for this year!! It’s only January and already things are changing tracks from what I even imagined could happen and in a good way. (One of these things I will be able to share coming up really soon!!) I hate to think that it is only one month in and I need to slim down what I had hoped to do, but also being honest, if I want to get more out of this year I need to be easy on my myself. So want does that look like for my channel, remember that amazing list of days I shared that I would be sharing?! I do, it has been yelling at me all this week. YELLING!! I have been struggling to post everything I really want to, and I even wasn’t able to finish my Podcast Inspired Layout. It is started at least, but I don’t feel like that really matters. I am thinking I really can only commit to posting on Youtube Three days a week. So I am going to be posting Monday, Wednesday, and Friday. I am hoping to share the series that I planned to on those days. I may some weeks, when I have less DT stuff due, be able to post an extra layout or two. This week I do have a Midori PL video to share and a Bible journaling video too. Those will be posted this weekend, but my Scrap Bin layout may be late this weekend. I know you scrappy fiends are happy with whatever I share with you, the pressure is very much the pressure I put on myself. And it’s strong, I want to give so much, that is just me. Though, I also need to be able to give to my family and myself too. Today I signed up for Big Picture Classes, I really want to take some classes to learn more this year. The more I learn the more inspired to create. And that is a very good thing!! Especially since I want to create a class this year too!! I hope you are taking it easy on yourself and giving yourself grace to change your goals and plans this year to match what your life really needs. It is so necessary for us to do this on a regular basis. I look forward to seeing you friends around this weekend!! I have a few things ready to share with you and I am excited to share them!! Have a great and inspired Weekend!! Aloha Scrappers!! I have had a busy and fun weekend and crazy start of the week, it feels like it is Friday. It is only Wednesday however. I really need the weekend to come so I can relax and scrap to destress. I want to share a project I made throughout last week and shared over at The Crafty Maven Getaway Youtube Channel. 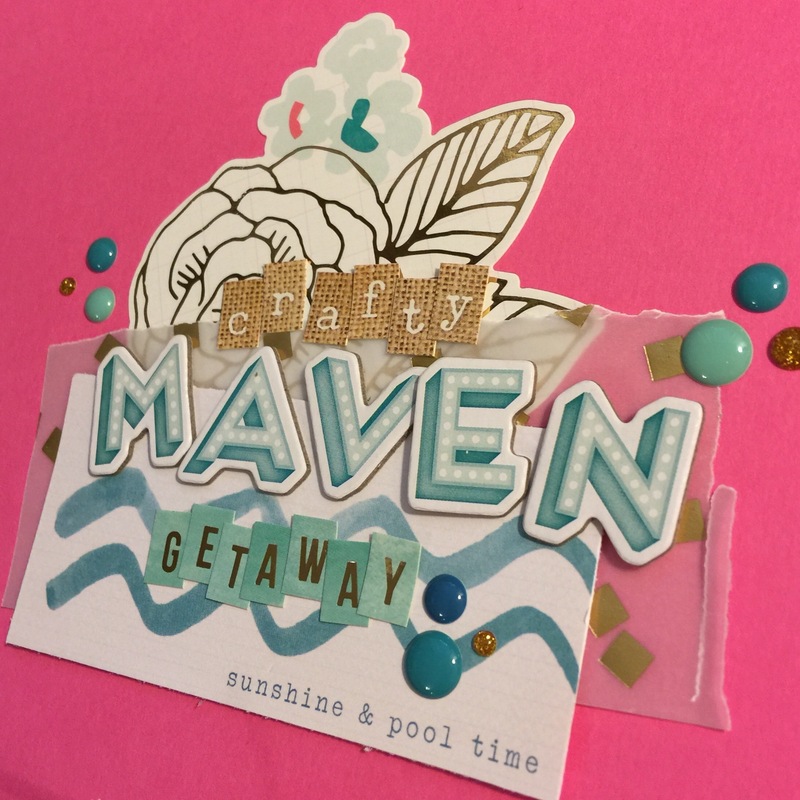 If you haven’t heard of The Crafty Maven Getaway yet, you need to check it out. There are so many amazing ladies over there. Everyday there is a new process video of crafting goodness. I used my December Clique Kit for much of this project. I really wanted them to match and look nice together but still wanted them to be different to match my kid’s personalities. The Pink Paislee Memorandum collection was a good fit, with it’s artistic feel but also that office or work feeling too. Plus I really liked the colors in this kit. I bought mini clipboards at a local store and cut my patterned paper out to fit most of the board. I covered both front and back of the clip board. I added my kid’s names to the back with the acetate from the kit. I embellished this back side a little with sequins from the kit, from Jilly Bean Soup. I also added hearts from the kit, and some Seven Paper too. For the chores part, I used my Evolution die cut machine. I cut out some Dear Lizzy Flowers and some different size tags. I used the Bella Bvld letter sticker sheet from the kit and also used some smaller alpha’s from my stash. Then I added the chore flowers and tags to clipboards. I added an envelope to one clipboard and twine to another. These clipboards were so fun to make for my kids! As scared as I was to use a kit to make them, it was nice to see my papers and embellishments getting used in a cute project. It really feels like I got a lot accomplished when I finished. I have a video on The Crafty Maven Getaway Channel showing the process of putting these clipboards together. You can watch it here below. Aloha Scrappers!! How has your week been? Mine, very productive in real life stuff, but very little scrapping done. But that is life sometimes right?! And since I need to sleep, I figure I should just roll with it. Next week will be a new week. I posted a new layout on my Youtube Channel that I want to share with you. I am trying to use up the last little bit of my November Hip Kit from 2015. It is christmas inspired, and since I still have christmas photos to scrap it makes me happy that I can use up old supplies. These photos are your typical my kids baking christmas cookies. I really like to see how each year they grow a little older and bigger. These photos are actually a few years old, from 2012. So my girls look so little, especially Cayden. They were so happy when they were making these cookies too. My mom, dad, brother and his at the time girlfriend (who is now his wife) came to spend a christmas at our place. It was really nice. We hadn’t all been together in a few years and it was the first time I was actually meeting his girlfriend. The girls love baking, and really enjoyed baking with Grammy. My Mom of course was loving it and soaking in the chance to do something special with her grandchildren. The triangle paper from Hip Kit really inspired me. I grabbed a small Amy Tan stencil with triangles. I pulled out some coral and copper paint and painted triangles on a diagonal across some white cardstock. I knew I needed to bring in some cool colors like mint or aqua. That guided me as I picked my papers for layering. I used two photos, one 4×6 and a 3×4 size. I almost didn’t use two, only because the color tone on them were different. One photo looks bright and has a cool color tone. The big 4×6 of Cayden has more of a warm tone to it. I am not sure if this happened from the printing process. I didn’t really edit these photos though. They were taken and edited by my sister in law with her very nice camera. I took that from my Facebook account. I guess it’s time for a confession, I use old Facebook photos on my layouts a lot. over the years and before I scrapbooked I didn’t make the effort to keep digital copies of my photos. So most of our baby photos of all three of our children are only on Facebook. Sometimes the quality on Facebook is great. Sometimes its not, especially when the photos are older and not taken on good cameras. I wish I had saved my photos differently, but I didn’t and it is all I have, so I use them. I built a cluster at the bottom, using the tags from the kit, a paper strip ( a thing I have been doing lately), glitter tape from the December kit, an envelope from my stash, and those adorable penguin and balloons from the PinkFresh Studios die cuts. I love how cute it looks. Now if I had thought things through better, thats where the stick it down and commit rule isn’t as nice. But if I was thinking, I would have added my cluster at the bottom with triangles. It isn’t horrible the way it is, but there is an awkward gap that could have been avoided but I didn’t think about that until after I glued down the penguin, and he was stuck!! I needed to balance the top and I added a small cluster at the top of my layout. I used a gingerbread button I had from my stash and a Elle’s Studio banner from last christmas, that I cut down. I added Studio Calico wood grain sequins and blue crystal sequins to add a touch of blue throughout the layout more. I will admit I almost forgot to add a title, altogether. I have been bad about that lately. I think it is more about just wanting to finish up and then I remember that I really should have one. I used the PinkFresh Studios puffy alphas from the kit, I didn’t have enough for the whole title, so I spelled out Grammy. I used some copper cursive alphas from an old Pink Fresh Studios embellishment kit I had leftover. They are perfect, they really work well with the copper paint I used on the background. I also used some block Bella Blvd Faith Illustrated alphas in blue. I added my journaling around the outside of the layout. I really like the way this looks. It brings everything into the layout and it really is easy to incorporate the journaling unto the layout without looking really out of place. Here is a look at the process video for this layout. It feels really good getting through some of my older christmas photos, and using up my old kits. I still haven’t touched my January Hip Kit, and man it is so pretty!! Have a great weekend my scrappy friends!! I hope you enjoy your time, whether you are crafting or not. This week I have been working hard! working hard getting back into the routine of life after the holidays, and that is tough!! I love that at the end of my day, I can play with some cute embellishments and pretty paper to destress. Even though this week I haven’t scrapped as much as I wanted to I have been so productive! Today on my Youtube Channel I am sharing a layout I made for my Heritage album. I love this series, seriously besides all the new scrappy goodies that I love to use. This series really makes me happy to scrap. I think it is my love of ancestral history has always really intrigued me. I love hearing or digging up these stories! Obviously not all my family photos have an actual story like the picture I used today. I love however if you look at history in general it is kinda cool to see a story emerge. It’s a cultural history story. This concept of taking a family portrait together, was a cultural norm in the early 1900’s. All the family got dressed up in their best Sunday clothes, and sat together and had one nice shot taken. That photo was put on a mantle or on the wall, so no matter how far the members of that family were they were held dear to their hearts. It is interesting that with technology so advanced as it is, this concept has been lost. We are too busy, to fat, don’t like that posed look, or we just don’t take the time to make sure everyone gets in our pictures often. Or at least this happens in my family. And it is sad, because as many photos as I have on my camera roll, there are truly not many cherish family photos. This year I plan to change that. I want my future family to know who each one of us is. Me and my husband included, and not just a photo of a book, my feet or even a selfie. Don’t get me wrong, I like selfie’s even if it is because at least I can now be in my families album. But this doesn’t really completely tell my story does it?! I want to have these photos that show us all together being us. Whether it’s posed or natural!! We are all apart of this great family, just like in my photo that I scrap. In this picture, which I think was taken sometime around 1928, is my great grandmother (Hazel) and her parents and siblings. The hardest part of scrapping this photo was that I didn’t know who each of the kids were. But I am glad I at least know exactly who my Great great grandparents are. I really love how this layout turned out too. I mentioned this on my voiceover, but when I decided to do this album, layouts like this was really what I had in mind. I really wanted a modern feel to it, even though I am using black and white photos. I wanted to make these photos come to life and fun. These colors and patterns really helped me achieve that. I even added some mixed media, in silk screen form. A silk screen is similar to a stencil but the media gets pushed through the silk material. It leaves a thinner layer of media on your page or project. Which is nice on a layout because it warps less and dries really fast. They work best with acrylic paint because it is thinner. I love the embellishment clusters with my great great grandparents initials in the layered clusters. And that gold glitter, who isn’t still in love with gold?! Here is the process video, if you want to watch me make this layout. I did notice that I misspelled my Families last name on my process video, and didn’t catch it until after I took photos and posted everything. Silly me, good thing I don’t get graded on spelling! I did go back and fix it, thankfully I had a g in my alpha pack. I hope you were inspired today!! I really enjoy sharing my layouts with this community. I love that I can give back after being so inspired by everyone else that shares their layouts! Aloha Scrappers!! Hope you are having a great weekend!! This weekend I have been working on trying to finish up my December Daily! I am ready to be done, I have really loved putting it together this past month. But after taking done all on christmas decor around my house I am now ready for sunshine and fun, bright papers in my album! I love christmas but I am a true summer girl at heart! Even though I am not quite done finishing up my album, I wanted to do a flip through of my album and what I have accomplished. I have rarely filmed my process so I wanted to get these up before everyone else is ready to put away their December Daily too. Here is my Youtube video sharing up to day 19. I hope you enjoy. When I am completely done I will do a flip through of my final pages. I also do have a couple pages recorded that I am going to be sharing this week too. I will make share I have some awesome pictures of my completed album on my blog too. Have an inspired weekend my friends!! It’s national siblings day!! This is a pic my little (big) brother @warhulk1776 and I took with my kiddos when we seen each In January. It makes me chuckle a lot. My kids were not cooperating to take a pic and this is seriously the best one and we are trying smile after smiling and making weird faces for five minutes. Thankfully we share the same sense of humor and found the laugh in trying to get the best shot. #Repost @shimmerzpaints with @get_repost ・・・ April showers bring May flowers! 🌸🌸🌸 They also bring The April Edition of Shimmerz Color Kitz! This gorgeous kit includes: • 1 package of @spiegelmom_scraps Sequins in “Pick Your Plum” • 1 2oz bottle of “Quit Yer Wine-n” Vibez • 1 Jar of “Lapis Dance” Creameez • 1 Jar of “Pink-a-Boo” Inklingz • 1 Jar of “Angel Wings” Shimmerz This kit will be available for retail purchase on Monday, April 1st at 9 AM MST. See you then!